Cotopaxi in Ecuador is one of the highest active volcanoes in the world. It was painted magificently in 1861-2 by Frederic Edwin Church. Church was inspired by the natural history writings of Alexander von Humboldt, and his 1845 treatise Kosmos. In the second volume of Kosmos, Humboldt included a chapter on the influence of landscape painting on the study of the natural world—ranking that art among the highest expressions of the love of nature —and challenging artists to portray the “physiognomy” of the landscape. Church retraced Humboldt’s travels in South America. From the excellent Vulcanisn blog Church visited South America twice, in 1853 and 1857, and was inspired by the mountains and volcanoes of the northern Andes to paint some of his greatest landscapes. Cotopaxi, which Humboldt had discussed at some length and which was one of the most aesthetically striking volcanoes of the region, as well as being one of the most active and formidable, was a natural subject for his art. Church’s earlier paintings of Cotopaxi depicted the volcano’s snowy cone rising placidly above a lush tropical landscape, steam rising gently from its summit, a living but benign presence. The painting shown here, executed in 1861-2, has a very different atmosphere. 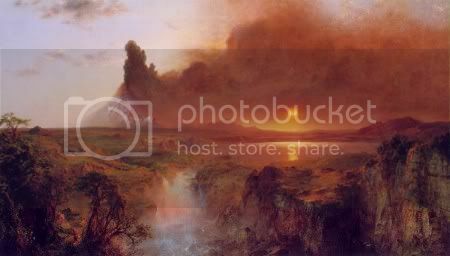 In this other-wordly scene we are presented with a staggering display of nature’s power, as the volcano violently erupts against a blood-red sunset, exploding upwards and spreading its dark smoke like a banner across the sky.